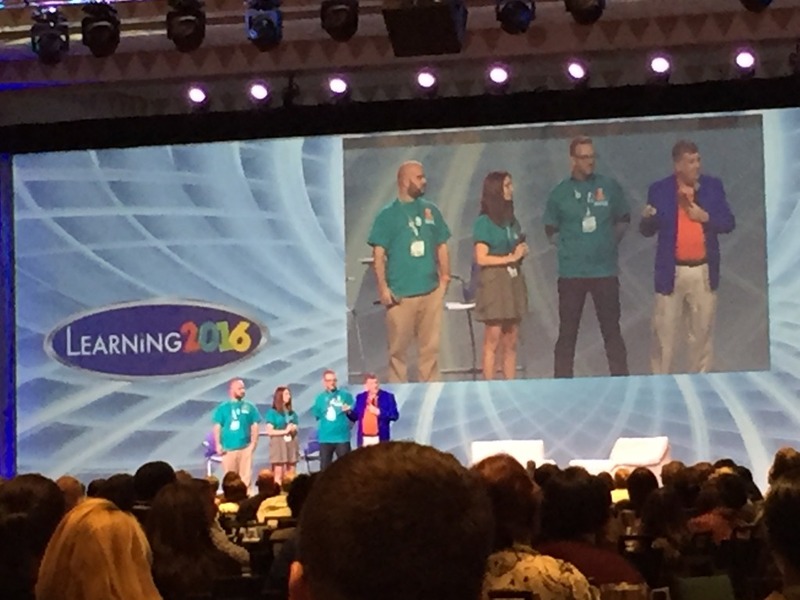 At Masie’s Learning 2016, there were many extraordinary events. In fact, soon curated content will be posted on the site. But in the meantime, here is my take on one of the most innovative and leading edge concepts…a Learning Escape Room. According to Wikipedia, an escape room is a “ a physical adventure game in which players are locked in a room and have to use elements of the room to solve a series of puzzles and escape within a set time limit.” The idea is gaining popularity and appearing all over the country. 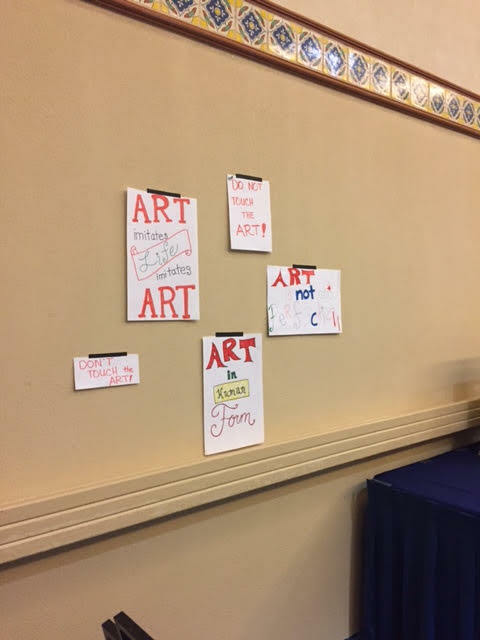 So a group of smart and talented folks spent almost all of their time at the conference crafting an escape room and leading eager learners through the event. Here an conversation I had with them about how they set up the event and how it came to fruition. Escape Room Team of Dan Laicha, Mandi Christensen and Clint Clarkson being interviewed by Elliot Masie. Kapp: First, please introduce yourself and where you work and tell me how you got involved with putting together an escape room. Laicha: I’m Dan Laicha, Instructional Designer for Bisk in sunny Tampa, Florida. 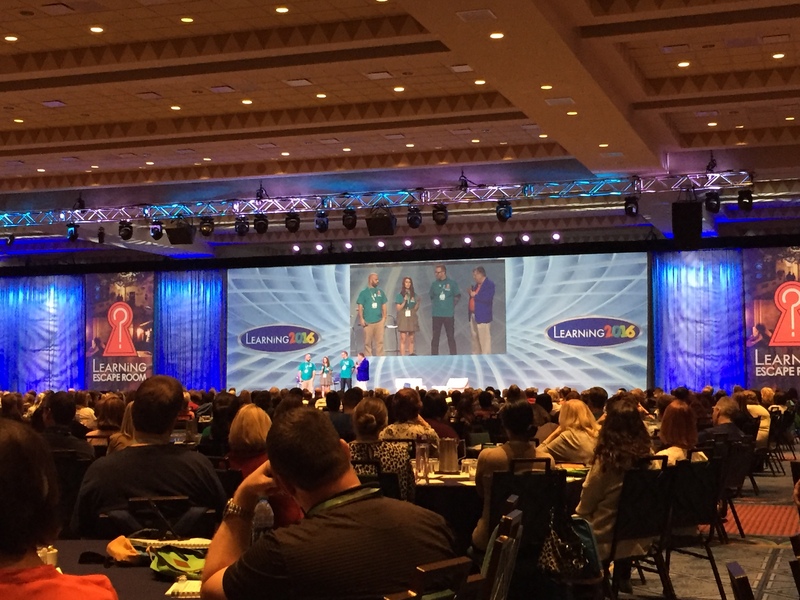 Mandi and I were both part of the 30 Under 30 group at Learning 2015 and were asked as alum of that program to come back and help build an escape room based around learning. I had never gone through an actual escape room, but did some research and found the concept pretty awesome! I was excited to work with colleagues in our field and see if this challenge could become a reality! Christensen: Mandi Christensen, Manager of Learning and Development for Caribou Coffee, Minneapolis, MN. Dan and I were both part of the 30 under 30 group in 2015 at the Masie conference. This year. Steve and Elliott reached out to us to see if we would be willing to partner with Clint on testing the idea of an Escape Room for Learning. Only having experience in being a participant in Escape Rooms in the past I thought it would be a great challenge to facilitate designing one! Clarkson: The idea of using an escape room for learning started while I was working with a transportation company. Our team had completed several of them and one day one of our team members said: “Why don’t we build an escape room?” So, we did. Since then I’ve joined Xpan Interactive, a Calgary- and Chicago-based eLearning development company. I am also working with WestJet a Calgary-based airline. Working on the escape room. Kapp: For those who may not be familiar with a “Learning Escape Room” can you please explain the concept. Laicha: An escape room is a series of puzzles that a group of individuals in a team atmosphere solve together to try and “escape” from the room. Teamwork and an open mindset are a must! Once the puzzles were all solved, the team has successfully escaped and completed the escape room. How they all got there is a different story! Christensen: Escape Rooms are puzzles in a real life scenario, people enter as teams and really have to work together as a team to solve the overall puzzle by solving small puzzles and clues along the way. Once the final puzzle is solved there is a way for the team to escape and they have won! Most Escape Games have a time limit included so the team have a time restraint to work within. Clarkson: The idea is pretty simple. Escape rooms are live-action games, where players collect clues and solve puzzles in an effort to escape a room. Clues are typically linked to an over-arching story about why you need to escape. In a learning context, we turn the clues and puzzles into content related to a learning objective. Kapp: Can you describe what the escape room experience was like for the learner? What did they have to do to escape? Did everyone escape? Laicha: We ran the escape room four times, and thus had four groups of teams that worked through the puzzles together. Each team had to solve 16 total puzzles, split into four groups based on our theme of “communication”. Then, a final puzzle allowed them to finish and base their time against their competition. Each group came at it differently; both in order, and how the individuals dispersed across the room to solve the puzzles. We had visual and audio clues interspersed, so it was interesting to see how each group deciphered each clue. Everyone did escape! The other learners were those that participated in the actual escape room. These people went through the room solving clues that were associated with Communication. Through the escape room and the clues the team learned effective ways to communicate, ways not to communicate and the different communication styles that are used in business. For our room everyone did escape, they had to solve four sets of clues that each included four clues within (a total of 16 clues with one final clue to solve) 17 overall. We did include a few hints so the groups would have a good chance to escape, and all did within the thirty minute time limit. Clarkson: To escape, learners had to solve four short puzzle chains related to communication. The experience was really exciting for the participants and observers. There was a lot of cheering, fist-pumping, and excitement about the escape effort. Observing how different learners tackled the puzzles was really interesting. Some jumped haphazardly between puzzles, while others focused on one puzzle until it was solved. Some learners formed small groups that moved together from puzzle to puzzle, while others floated around on their own. Dan and I were particularly generous with clues and leading learners in the right direction. We made sure, everyone escaped. that people learn or can they learn content as well? * Powerskills are the new name for what we used to call “soft skills”. Laicha: Teamwork I thought was very important, and what separated the teams most in how they attempted to solve the puzzles. We focused our project around the theme of “communication”, so there was a lot of application of knowledge there. Once the team learned how to solve one puzzle, it seemed to me that they kept learning how to better work together and more easily solve elements of the escape room. Christensen: Both! Powerskills and content were the objective for this particular escape room, but really you would design it for either or as well. Powerskills included with this room were teamwork and effective communication. The content that was learned was around the topic of Communication, including different types of communication strategies, ways to communicate effectively and in-effectively and how to communicate in certain situations. What we found when designing this escape room was depending on the goal you could design the room to work for your particular needs as Clint outlined below. Clarkson: As with any learning event, defining your objectives is a critical first step. If obtaining or practicing powerskills is the objective, the story and content of the escape room could be almost anything. On-the-other-hand, if the goal is to transfer skills and knowledge, a lot more consideration needs to be put into the build. I like to think of it as a three-part process: discover a clue (such as a process for dealing with an angry customer), solve a puzzle (answer a phone call from an angry customer and correctly handle it), receive an award (the caller gives you a clue required for another puzzle). Talking about the escape room learning adventure. Kapp: What advice would you have for a company that wants to set up a Learning Escape Room? Laicha: We had a fairly large number of volunteers to create the puzzles for the escape room. It was extremely important that we ensured the groups were evenly split and that each group had at least one member that had personally experienced an escape room themselves. Deciding on a time limit right away was huge, because it really focused everyone on how in-depth the clues could be. Being very open to creative ideas and structures is very important. We designed our learning escape room one way; I feel as though it could have gone in almost any number of directions! It really was dependent on the awesome creativity and thoughtfulness of the members creating the puzzles to decide what the participants will get out of the puzzles. Christensen: Agree with Clint that having a few facilitators that have participated in escape rooms before is key. It is important to have a few people who understand the overall concept to help guide the design. I think the design we used at Masie was well thought out, a few people (2-3 mx) who help with the facilitation and design, and then engage a group of more people (5-10) in the design. Including people in the design ensures there will be more engagement, but you have to be careful to not use the same people as designers that will be participating. Goals are important, so knowing what the time limit will look like will help guide the amount of clues to include as well as what can be taught or gained from the experience. You can’t plan to have a 30 minute escape room where the learning will get all the knowledge they need from the employee handbook, it has to be realistic. Also, knowing that it doesn’t have to be a huge financial investment, we were able to pull this off in one day of planning with very basic tools (cardboard boxes, magazines, coloring books, locks, puzzles, etc.) Companies worry about budget and knowing upfront that this can be done for a small budget is a key learning. Clarkson: First, complete 2 or 3 escape rooms with the team that will be building the room. Playing through a few different rooms will help you understand how they work and give you a lot of inspiration for your own puzzles. Second, test the room for timing and clue difficulty. It’s easy to build a room that’s too difficult. You’re unlikely to build a room that’s too easy. An important decision you’ll need to make is the acceptable failure rate. Should everyone escape within 60 minutes? Is it okay if only ⅓ of team escape? Plan on 16-20 puzzles for a 60 minute escape room, depending on difficulty. Last, plan time to debrief and review what was learned. If unsuccessful, escapees will want to know what they didn’t solve. 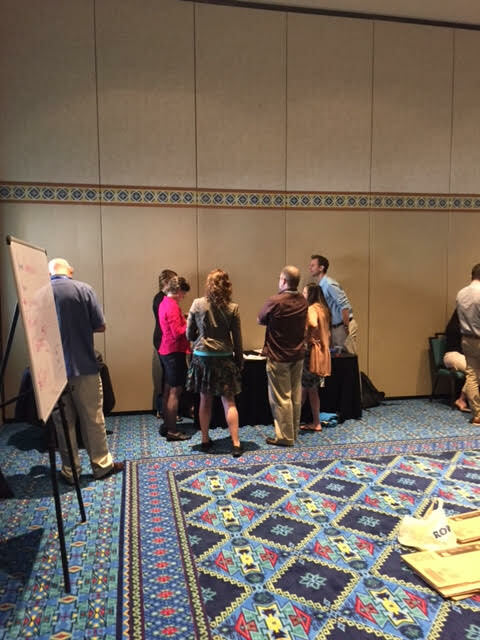 Kapp: What lessons learned from the experience would you incorporate into your next Learning Escape Room Design? Laicha: I would say that I would like to use the theme more effectively the next time around. Our “communication” theme was great, and led to some truly great ideas for puzzles. I feel like that aspect would be a lot more focused the second time around. We learned that the creation of this idea was possible, given our constraints! I would love to mix it up next time and start from a completely different setup. I would love to use a differently shaped or sized room to see the differences for the next instance! Christensen: I would like to give time at the end to include some sort of assessment or quick quiz to see what the team learned from the experience. So our goal was for them to learn communication styles and effective communication, did they learn that or were they so caught up in escaping that they missed the message. We learned that we can create an Escape Room in one day and have it running the next, but I would also like to learn how effective the idea is as an actual learning tool. I have a hunch it would be very effective, but it is always nice to know! Clarkson: An idea I’d like to try is the “Locked Box.” It’s the same concept, but instead of finding clues around a room they’re all housed within a single box (like Russian nesting dolls). It’s more space friendly, and ensures all learners are focused on the same problems together. Kapp: Thanks so much for talking to me. I love the idea and the concept. Great work! 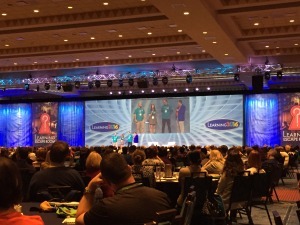 Laicha: Thanks enjoyed it and enjoyed representing Bloomsburg University in this activity. Clarkson: Thanks, great talking with you. Christensen: Thank you Karl for reaching out. We would be happy to work with other companies that want to try this out! Thanks so much for putting this interview together, Karl! It was a really special event and I hope we have a chance to do it again. If anyone has further questions, they can find me on LinkedIn (https://ca.linkedin.com/in/clintclarkson) and Twitter (@ClintClarkson).